Availability: Selected Clicks stores nationwide. I tried out the Aussie collection when it first arrived in South Africa but actually totally forgot how great this range is. It is simple and easy to use and has a great smell. The shampoo has a clear consistency and I only needed a drop for it to lather into a foamy, cleansing shampoo. Usually I wash my hair twice with shampoo before applying the conditioner, or until I get that “squeaky” clean feeling. With the Aussie Mega Shampoo I only had to wash and rinse once to achieve this. My hair was left incredibly soft and shiny with a subtle scent too. I also felt that I could get away with an extra day before having to wash my hair again as there was zero build-up of product. The plus side to this Street Art Limited Edition range is the bright packaging. It definitely stood out on my shower shelf! This brightly packaged shampoo has completely blown me away. I’m usually very hesitant about using brands that I am not familiar with, especially on my very thick wavy lions mane. However this product delivers on its promise of leaving your hair (literally) squeaky, light and clean! It totally removes any build up of other hair product or oil. The bottle has a convenient flip-up lid and only a dollop of this clear shampoo is needed. It really lathers up and goes a long way, leaving your hair with a delicious sweet smell! My hair seems to be able to go longer between washes since I have started using this range, which is really a blessing and a time saver! I have received more compliments on how healthy and shiny my hair is looking in the last week than I have in months. I absolutely intend on repurchasing this product as well as recommending it to friends and family. This shampoo claims to rinse hair clean without build up and to leave your hair with vitality and shine. I think this product is visually appealing and it’s transparent color makes you feel like it is going to clean your hair. I am visually drawn to the product. The smell is very nice; it is not as strong as the deep conditioner. The packaging is nice and easy to use, you do not fear it will leak when travelling because it seals well. It left my hair feeling clean and it stayed clean for a while. I would not likely repurchase this product as my hair is colour treated and requires a colour protect shampoo and conditioner. Having curly hair means I use a lot more conditioner than shampoo. But it was a nice product to use. I enjoyed using it and think the product sticks to its claims. I would definitely recommend it to my friends. The shampoo came in a cylindrical bottle that had a vibrant purple graffiti type artwork splashed on it, amidst a white background. I think the design is pretty cool and would appeal to the young teen, right through to the free-spirited adult. I was also impressed with the spill proof cap. The opening was on the side, leading to far less chance of accidents in the shower, should the bottle slip form ones hand. The shampoo itself smells like candy and just a small drop gives you tons of foam. This means the bottle will last a really long time and you only need to lather once to achieve squeaky-clean hair. I was impressed that it seemed to clarify my hair and remove all residue and was very easy to rinse out. My first thought was ‘Ah, just another shampoo’, but was I wrong. The packaging of the bottle is funky and draws attention with little Kangaroos on the top. The bottle is easy to grip and open which is great. The purpose of the shampoo is to cleanse hair, remove build-up and leave hair feeling squeaky clean and shiny and can be used everyday. The shampoo is clear with a medium consistency and lathers with just a small amount. The smell of it is just divine, it has a sweet almost fruity scent, which is unique, and I’ve never smelt a shampoo like this before. A big thumbs up. My hair feels clean from the first wash and the build up is removed with no hassles. My hair felt softer the moment I rinsed it and the scent lingers on which is such a bonus. There is a difference in my hair since I started using the Aussie shampoo, conditioner and deep conditioner. I’m totally amazed with this product and would purchase this again and recommend it to everyone I know. I love the funky street art graffiti type label with vibrant colours and the kangaroos embossed on the containers. I love the fruity smell. I can definitely smell paw paw or something similar. It contains the Australian Paw flower that cleans without leaving any build up. The shampoo is clear, thick and lathers well. My hair felt very clean after application. The shampoo is great for normal healthy hair. I would definitely not recommended it for dry, coloured, frizzy or damaged hair as my dry hair felt dry after application. Personally, I think the price of R69.95 is also a bit too steep for me. FINAL VERICT: Great for normal healthy hair, but if your hair needs special care, rather look for Aussie’s Miracle Moist shampoo and conditioner. When I opened my package containing the Aussie shampoo, it had leaked and I quickly snapped the cap shut. By then, a few of my colleagues were asking me what that “delicious” smell was. I didn’t even mind that the bottle had leaked because it truly smelled so yummy, nothing that a quick rinse under the sink won’t fix. I put the shampoo to work and it does a fantastic job of getting rid of my oily roots without drying out the ends of my hair. You see I have very straight, long fine hair that reaches my bellybutton so I’m always looking for products that give me a boost of moisture without weighing it down. I cannot fault the product at all. The bottle is super cute and almost has a vintage feel with the updated graffiti vibe. I wash my hair every second day so this is definitely something I am happy to use frequently. Aussie’s range of hair products are so affordable, yet you would think you’re using a salon quality brand that’s almost four times as expensive. I love Aussie so much that I bought the range of shampoo, conditioner and deep conditioner for my friend as a Christmas gift in 2012 for her unruly, curly locks and she’s been addicted ever since. The purpose of the shampoo is to leave your hair clean and shiny. The shampoo packaging is very practical; it is a nice size to hold in your hand. The colour of the packaging attracted my eye as it is very colourful. It smells so clean and fresh. It’s consistency is nice and thick. I have noticed a difference in my hair since I started using Aussie Mega Shampoo. I don’t need to wash my hair everyday. My husband says my hair is looking very healthy. It lasts longer as I only wash my hair every second day. I am very impressed with Aussie Mega Shampoo and I will be buying it in the future. Before I say a word about this shampoo, there’s something I must say about the entire range… You WILL fall in love with this product before you’ve even opened the bottle – it will leave your entire bathroom smelling like a candy store! If you enjoy lovely, flirty fragrances, you can’t go wrong with Aussie. The scent and the packaging make the shampoo very attractive, and the street art edition is bound to catch the eye. The shampoo itself is a beautiful gold liquid that lathers easily. I really wanted to put this product to the test, so I tried it on rather dirty hair, and had to repeat the process to get that squeaky clean feeling – not that I minded having to rinse and repeat with such a gorgeously-scented product! Being in the shower with this shampoo is the perfect way to end the day. It states, ‘For everyday cleaning’, and I must agree. 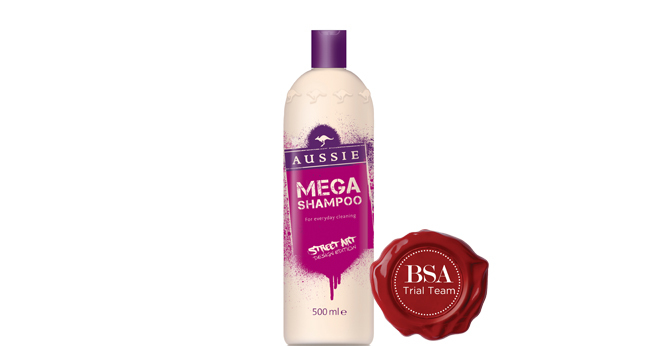 If you have oily hair, or you’ve used a lot of product in it, you’re likely to need a double dose of Aussie Mega Shampoo. This one’s for those who enjoy the rinse and repeat! This is a delicious smelling shampoo. The packaging is clearly marked as for what the product is intended for. This shampoo is easy to open; you simply press the top of the cap. The formula with Australian Kangaroo Paw Flower left my hair squeaky clean without build up. It has a medium consistency with a ‘peachy, almost clear’ colour. It lathers very, very well. This product is gentle enough to use everyday. I found that it wasn’t necessary as I went an extra day without shampooing. I am very happy with this shampoo; it has left my hair shiny with bounce and healthy looking. I definitely recommend this shampoo and would repurchase it. Like every woman, I must have tried every shampoo on the market. I wonder if it’s the Kangaroo Paw Flower that gives this its edge. On my first wash, my hair definitely looked and felt cleaner, and the fragrance was not the typical “soapy” scent you get with most shampoos. The shampoo is thick and lathers, and washes out very easily. It literally felt as though my hair had a protective coating on it, a slightly slippery feel, after rinsing. I definitely noticed my hair was not as dry as with most shampoos after using this. I usually wash my hair everyday but found I could last two days between washes with this! As for the packaging, I had to make a quick trip to JHB and found the packaging couldn’t have been made better! You have to click the lid down to open it and this ensured it did not leak into my luggage. It’s also extremely convenient when you have soap in your eyes and don’t need to battle with unscrewing a lid or having it pop off, as often happens with flip tops. I am a covert. I will be buying this again and again. The shampoo promises to clean hair, prevent build up and leave your hair feeling full of vitality and shine. It does deliver on those promises. It is pale pink and has a delicious strawberry scent. I needed a small amount for my mid-length fine hair. After using it the first time, I was amazed. It left my hair literally squeaky clean but without feeling stripped and dry. The lather was not overly foamy as some shampoos tend to be and therefore didn’t drip all over the place. The 300ml plastic bottle is pale cream in colour, which makes the pink and purple graffiti branding really pop and grab attention. I noticed an increase in my hair fall after using this product so I would be careful not to use it for every wash. I would definitely recommend it for every third wash or for anyone who uses a load of hair styling products and just wants a fresh head of hair. I love the smell; the cleaning power and I love the feel of my hair after use. It’s the first time that I have tried the Aussie range. I have heard of this range before and was pretty excited to try it on my hair. I love the design and bright splash of colour on the bottle as well as the beautiful kangaroo detail. The subtle floral scent is very refreshing. The shampoo is transparent in colour and is very light and gentle on the scalp. I felt that the consistency was slightly weaker than other shampoos I have used in the past; therefore I had to use a little more shampoo than I normally do. After my first wash with my hair felt light, clean and fresh. I like this shampoo and would like to continue using it; but since it’s a limited edition I will have to try the other Aussie shampoos and find a new personal favourite. This product promises to rinse away without any build up, leaving your hair full of vitality and shine, and it did exactly that. It leaves a squeaky clean feeling once rinsed off (which I personally didn’t really like) and an instant shine. The packaging is easy to use with a flip open cap, saving you the hassle to screw the lid on and off. The design is eye catching as it is one of my favourite colours, pink, and also has a street art design. It has a sweet floral smell that leaves a subtle scent in your hair. What I loved about the product is that it lasted about 3 days before my hair went greasy and I didn’t need a large amount in my long hair as it lathers very well. Although I don’t personally like the squeaky clean feeling, I love this product and I would definitely recommend it to someone wanting to try something new. The Aussie Mega Shampoo for everyday use is ideal for getting rid of that pesky product build up, leaving your hair super clean, but without it feeling stripped or dried out in any way. I found that it lathers nicely, but not a whole lot, so you are not left with mountains of foam in your hair, which also makes it easier and quicker to rinse out. The shampoo is a clear gel, with the most amazing aroma that reminds me of fruity gummy sweeties and comes from the Australian Kangaroo Paw Flower, which is used in all of the products in this range. This shampoo has definitely become my new favourite, and I will most certainly sing its praises to everyone that I know! I have been using this shampoo every day from for over 2 weeks now and it has been a awesome experience. This shampoo is kind to hair and doesn’t strip any natural oils from the hair. It doesn’t leave my hair greasy and weighed down, and a bonus is that it tamed my very unruly frizz that I normally experience from other brands. A small amount is all you need for a rich lather that cleans hair gently with a amazing fragrance. The Packaging of Aussie Street Art is funky. I love the graffiti look with bright pink and purple and the label is a real eye catcher. The squeeze bottle makes for easy handling, no mess no fuss as the top opens and closes easily. My hair has never felt better it feels soft and silky. I am loving this shampoo and am definitely repurchasing once mine is finished. The cream and purple look great together; a very inviting bottle of shampoo. Something about the Kangeroo doesn’t make much sense to me, however the smell reminds me of being in a hair studio. Much relaxation and a good smelling shampoo is key when I purchase. It’s got that fruity yet clean scent. While in use I noticed that for the type of hair I have this shampoo was self conditioning. I don’t really use conditioner as my hair gets oily very fast so this was really good as it helped my hair get the nutrients it needed without making it oily. I’ve been getting good compliments about my hair glowing so big thumbs up for that. I generally have to wash my hair every second day, I notice no different with this as I had to do the same while using this product. This shampoo cleans the hair beautifully and doesn’t cause any build-up so it can be used every day, great for people that go to gym and need to wash their hair daily or regularly. The packaging is practical, it comes in a bottle and the lid can open or close and you just squeeze the bottle and the shampoo comes out, so there is no worrying about the shampoo leaking or the bottle falling and all the shampoo spilling out. The shampoo smells really good and keeps my hair smelling wonderful until my next wash. It has a gel-like consistency and you only need a little bit to wash your hair as it lathers very well. I have long hair so I use a bit more. Since I started using this shampoo my hair feels and smells good all the time, not to mention super clean. My hubby has even told me how good my hair smells so it just goes to show this product is simply fabulous. I really like that I can use this shampoo daily and that it leaves my hair feeling refreshed and smelling great. I would definitely purchase this shampoo. Thank you to the BeautySA team for sending me this product. This shampoo has a divine smell and works into a great lather using very little. However, it leaves my hair fairly dry and quite knotty. The bottle is also considerably smaller than regular shampoos and won’t last very long in my house. I would not change to this shampoo. The scent of this delicious honey looking shampoo is so amazing, as soon as I opened the bottle, I could get the whiff of a dreamy heavenly shampoo, I was so excited to experiment with this shampoo. What really took me by surprise was the shampoo’s consistency, it was thick with a glossy look (similar to honey) yet it lathered up so easily into a silky smooth creamy foam, I seriously couldn’t believe it, while rinsing my hair, I could feel how clean my hair was, I was impressed because in one wash of the Aussie Mega Shampoo, I had achieved silky soft and clean hair which I normally achieve in two washes of my regular shampoo, I thought this was efficient because you actually save shampoo this way and who would ever want to run out of this amazing shampoo? I think the product deserves a full thumbs up, firstly I love the squeeze bottle, it makes it much easier to use, however I find the press down lid slightly dangerous because upon delivery the product had spilled, so it is quite easy to mistakenly get pressed and leak out.